taking a break I suppose! I did some core ab work today.. I still have this split part between my muscles. How long does it take for that to go away? It felt a little weird, more so I feel like something is sore in my spine. Anyone else have that? What about the jelly belly – that is kind of poopy – how long till that goes away? 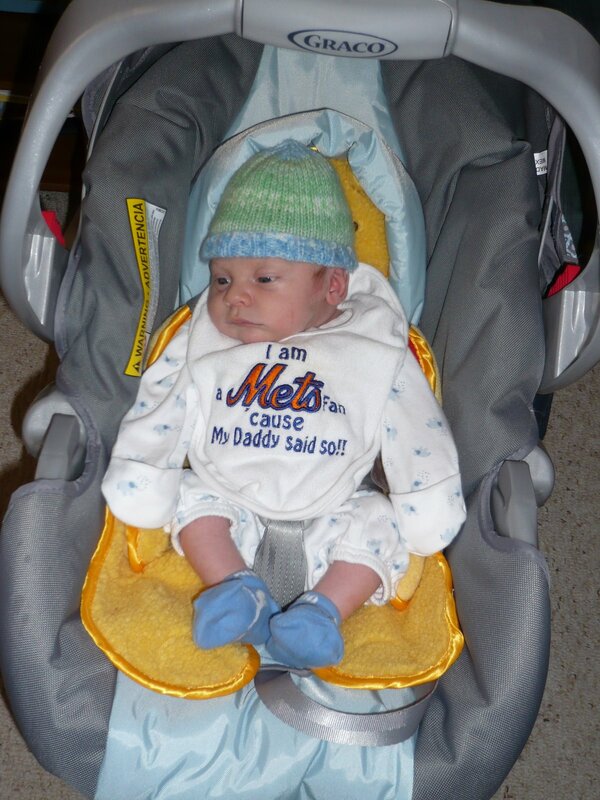 We took the baby for a walk today – fun times – and a better picture. I posed and ran for the picture. My diet has been decent, I’m not really limiting much, except things that might cause the baby to be uncomfortable. I feel like my weight is just stabilized. Is that what happens? I’m not in freak out mode at all, just keeping track! Will I start losing weight from the nursing and working out soon? How much should I REALLY be eating? This little guy seems to be eating well! Don’t freak out. I think it was 3 months two months before I hit my pre-preg weight and now I’m at 5 months and I am 12 pounds below my pre-preg weight and this all happened without trying. If you are breastfeeding you will just gradually lose weight without trying (unless you start eating peanut butter covered cheese cake for breakfast everyday or something). Re: Jelly Belly…..I still have mine. Then again I had one before I got pregnant. Give it some time…you should be back in no time. I have a jelly belly and I never had a kid!! As for the split in the abs (rectus abdominus), Grant is 9 months old and I still have that. Some people’s never close back up. I even teach fitness classes and do ab work all the time and mine is just not closing. That being said, you could never tell I even have it. My abs look and feel normal and I can only notice it if I am doing a sit-up and feel for it. I have a feeling mine won’t be closing. Also, don’t be discouraged if you don’t drop all the weight until after you wean. Some people lose all their weight and then some from nursing and other people hang onto those extra pounds to keep their milk supply up. You never know which your body is going to do. HAHA hes so cute!!! You look like your having a ball on your run!! I don’t weigh myself or restrict food (other than Indian curry — learned that the hard way), but sensed a plateau for a couple weeks, then suddenly realized I fit back into pre-preg pants the other day. The jelly belly though? I will most definitely be buying a one-piece for the pool this summer. The jelly belly is deceptive and not really strictly tied to your weight. I’m smaller now than prepartum and still have a suspicious jelly belly… though it’s much less now than it was right off. Others have told me it depends but should be firmer 9-12 months pp with exercise and diet…. The problem is it’s not all fat, it’s extra skin, too, that just needs time to tighten up! No experience, but I love reading all the comments other people have. Such good future info. 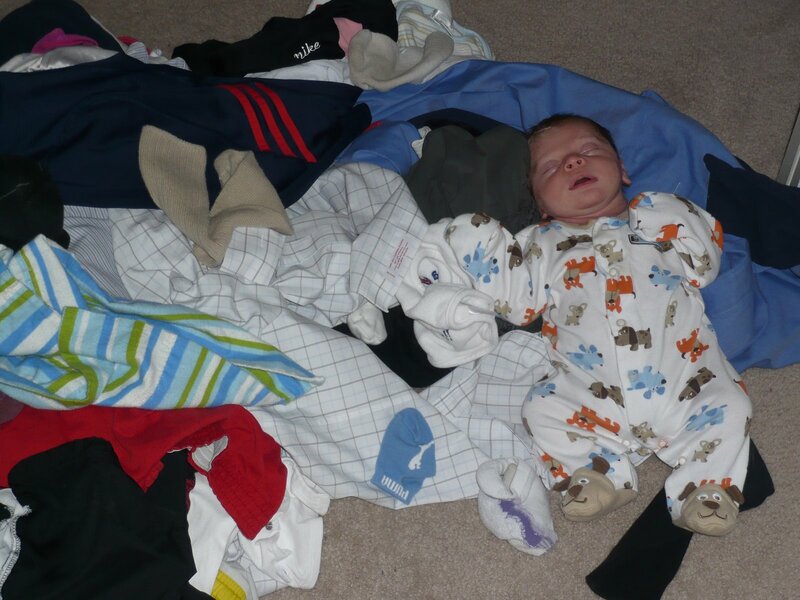 love the pic of the baby (supposed to be) folding clothes. Gotta start early, right?! Stephanie is right. You just might be one of those peeps that won’t lose the last couple pounds until after you stop nursing. Some peeps bod’s want to hang onto to that fat for milk production. Have to agree with Stephanie and Marcy on this, I was one that kept about 10-15 pounds of weight until after I stopped breastfeeding, then it came off pretty easily. Heather I think is spot on with the jelly belly. It’s not all extra fat. Depending on how big your belly got, it can be a lot of loose skin which was is the case for me. My belly was almost twin size with my first son. I didn’t even grow into the extra skin with the second pregnancy.Don’t worry though, you’re doing fine and you look great. As long as you feel good, forget about it till you’re done breastfeeding.